Gold Glorious Gold: did you know that photographing gold is notoriously hard – it’s something about its lustre and luminescence that bewitches and beguiles even the camera and its Le Carré-esque micro lens! So, do forgive the brilliance that dazzles the imagery below, but do enjoy our first Earring Edit. With London Fashion Week coming to an end and the wild at heart prancing about in leopard print we decided to appeal to your animal instincts and go with gold! Pssst: Were you aware that gold goes with absolutely everything in one’s wardrobe!! 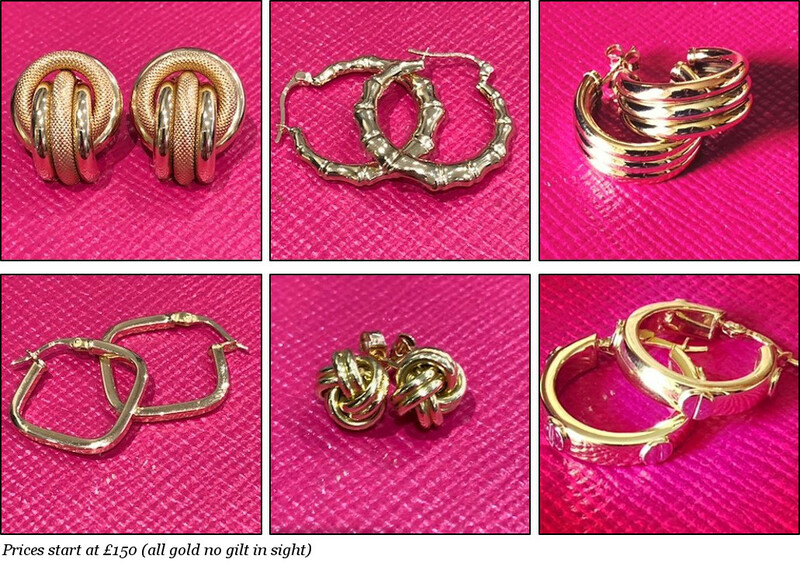 You can even prove your metal and jump through gold hoops whilst your heart beats at a rate of knots – well obviously not literally but you can wear these pieces ANYWHERE and with ANYTHING! So apart from sartorial styling tips and im-purrfect puns we are also literally bequeathing you the harvest festival earring edit of gold! Click on the picture and be transported into our tremendous treasure trove with pricing that is pretty much gilt free!